What would Olmsted do now? 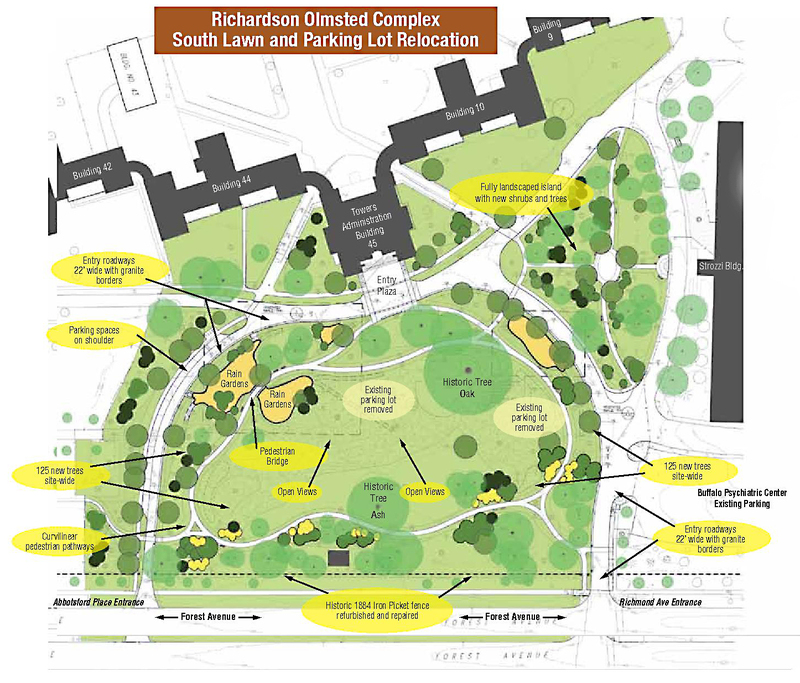 That’s the question designers attempted to answer as they created a new landscape for the Richardson Olmsted Complex, a National Historic Landmark. The designers wanted to remain true to the original intent of acclaimed landscape architect Frederick Law Olmsted while addressing concerns of the 21st century. 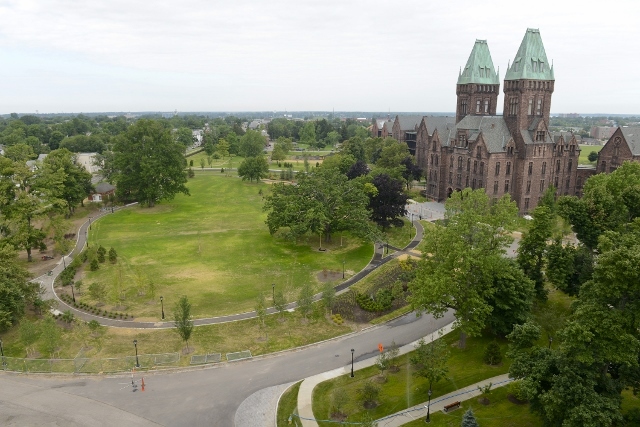 You can see the new landscape during an event for the public called South Lawn Celebration from 11 a.m. to 4 p.m. Saturday, Sept. 28 at the complex, 400 Forest Ave., Buffalo. Free outside tours throughout the day will highlight the past, present and future of this iconic complex, with a special focus on the grounds. Entertainment will include live music by Jason Myers on bagpipe, the Bar-Room Buzzards, the Buffalo State Jazz Combo, the Albrights, the Diaspora Drumming Ensemble and the Nickel City Pimp Choir. Drew Kahn of the Buffalo State Theater Department will be the master of ceremonies. Other entertainment throughout the day will include magician Mike Seege and Mugsy the Clown. 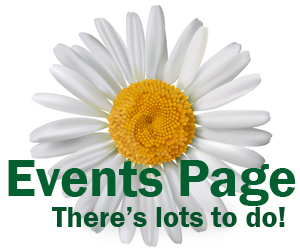 Activities include the Great Lakes Kitefliers Society, a letterboxing scavenger hunt, crafts and face painting with the Buffalo State College Art Education Student Association, lawn games including KanJam and the creation of a Richardson Towers mosaic with Faces of Buffalo. Free parking is available in the Buffalo Psychiatric Center lot on Elmwood Avenue. The Richardson Olmsted Complex, built in the 1880s, was a partnership between Olmsted and the noted American architect H. H. Richardson. 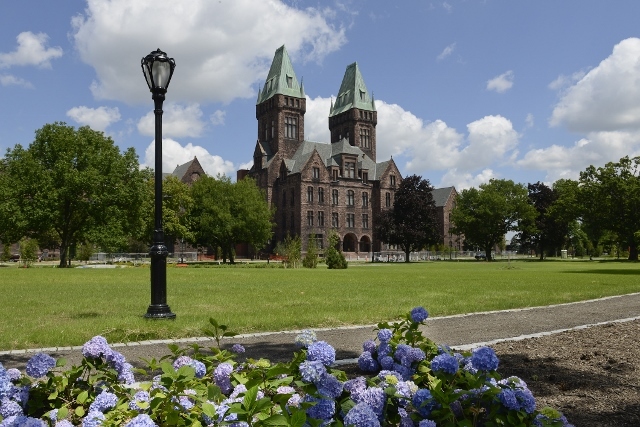 It was built as the Buffalo State Asylum for the Insane and was later used as the Buffalo Psychiatric Center. Patients were moved to modern buildings elsewhere on the property in the 1970s and administrative offices were moved in the 1990s. The Richardson Center Corporation, a not for profit organization, is rehabilitating the landmark buildings. The first phase of reuse will be as a hotel, event and conference spaces, and Buffalo Architecture Center. All are expected to open in spring 2016. The new landscape tries to be reflective of history while creating a contempory space, said Monica Pellegrino Faix, executive director of the Richardson Center Corporation. The area was off limits to the public for so long, but now it is meant to be a space that people can enjoy. The South Lawn redesign was done by Andropogon Associates,which is internationally recognized for ecologically based landscape architecture and planning. 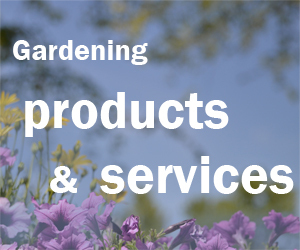 They were selected from a 2010 competition of nationally recognized landscape design firms. The area had two enormous parking lots that have been moved. A curvilinear pedestrian pathway was added. An entry plaza of granite and flagstone in front of the Towers Building serves as an elegant drop off for visitors. 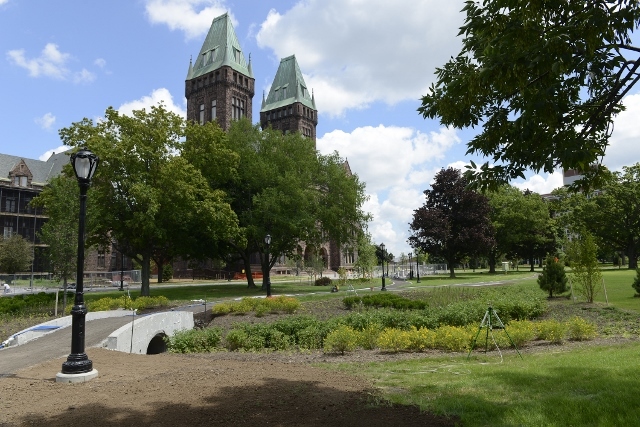 Two rain gardens have been created that reflect 21st century sustainable practices. The rain gardens, which cover more than 5,000 square feet, serve as attractive planted areas that address storm water drainage to improve water quality. A pedestrian bridge allows people to walk through the rain garden. Faix noted that it will take 20 years for the vision of the landscape to come to fruition.